The bedroom makeover is in full swing. I didn't quite finish the painting this weekend and therefore we've been sleeping with no blinds on the windows, and the bed and dresser are pushed to the middle of the room. Zach is thrilled. But I did finish some artwork for the room, easiest project ever. I will warn you, it's a little cheesy. I typed these up and printed them at home. They are lyrics from "Earth Angel" by The Penguins, it was the song we used for our first dance at our wedding (I warned you about the cheese). Then I painted the mats gray using a leftover paint sample I had, and threw them in two Ikea RIBBA frames that I also already had. The font I used is called Traveling Typewriter, and you can download it here. I love how they turned out! 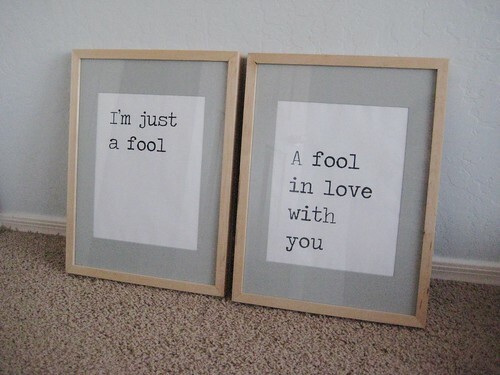 I think I am going to hang one above each of the nightstands. I love it! What a great idea...not cheese at all. Those are seriously so cute. And such a good idea, and anything pertaining to your amazing wedding or perfect relationship is a dose of good cheese. Yet another perfect idea. I love the font and the painted mats. Wouldn't have thought to paint mats, but why not? I am really excited to see the finished makeover.